Later, Sig used his knowledge of communication and public speaking to help transform his community by leading six bond initiatives in Wake County and the City of Raleigh totaling $300 Million Dollars for open space preservation, parks, greenways, transportation and affordable housing. Sig continues to be active in North Carolina where he sits on numerous boards and most recently ran for the NC State Senate. Board activities include Prevention Partners; NC Alliance for Health; Bicycle Pedestrian Advisory Commission for the City of Raleigh and former chair of Triangle Transit. Sig also chairs the Open Space & Parks Advisory Committee for Wake County and Board Chair for Advocates for Health in Action. 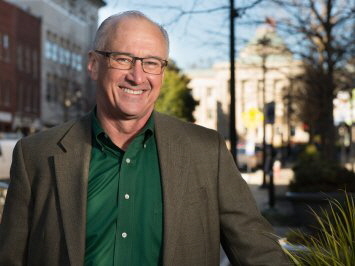 He has also been a driving force behind the creation of more than 200 miles of interconnected greenways as former President of the Triangle Greenways Council. Sig has been honored as “Tarheel of the Week” by the News & Observer, “Volunteer of the Year” by Wake County, “Green Advocate of the Year,” by the Triangle Business Journal, “Top 50 Entrepreneurs in the Triangle,” by Business Leader Magazine, a “Goodmon Award” by Leadership Triangle, the “Citizen’s Award” by the NC Chapter of the American Society of Landscape Architects, “Leadership Award” by WakeUP Wake County and the A.E. Finley Distinguished Service Award by the Greater Raleigh Chamber of Commerce. Sig continues his sales consulting and professional speaking career as President of Sig Hutchinson Communications. He has a B.A. from Texas Tech University; M.Ed. from the University of South Carolina and lives on a greenway in Raleigh, NC with his wife of 32 years Nancy and they have a son who is married and three grandchildren. "We live in one of the most beautiful places on earth, and yet our past successes provide no assurances of future successes. If we don't start planning now and protect our great quality of life in Wake County, it will slowly start slipping away." Former Raleigh Mayor Charles Meeker, Sig Hutchinson, Raleigh Mayor Nancy McFarlane, Former Raleigh Mayor Smedes York, Former Raleigh Mayor Thomas Bradshaw. Copyright © 2015 Sig Hutchinson Communications LLC, All Rights Reserved.